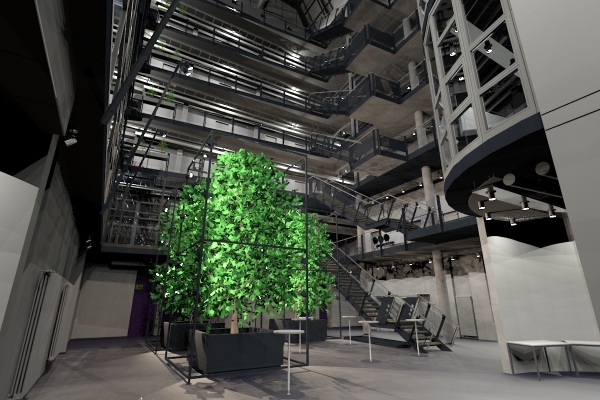 This model is a virtual reconstruction of the Max-Planck-Institute for Informatics in Saarbruecken building, done between 2003 and 2009. The resulting geometric, reflectance, and luminaire data can be used for various research activities including computer graphics, computational and algorithmic geometry, computer vision, databases, etc. A significant advantage of this data set is the availability and accessibility of the real building as a reference for other data acquisitions and validations of proposed and tested algorithms. The level of detail of the building model goes down to the furniture installed in the building. The size of the 3D model is in the tens of millions of triangles. You are welcome to use the data and models for research purposes and redistribute them for free. Please keep the rendered images and other uses of this model or its parts in good taste. You may publish images made using these models, data, or the images on this web site, in a scholarly article or book - as long as credit is given to the Max-Planck-Institute for Informatics. The model, images, or other data on this website are not to be used for commercial purposes without our explicit permission. Please be sure to acknowledge the source of the data if you use it for your research, either in the text or in the acknowledgements of your publication. We appreciate citing the research report ([PDF], [BibTex] or [BibTex short]). Research Report: [PDF], [BibTeX], and [BibTex short], December 2009. Project presentation slides: [PDF], July 2009. EGSR 2010 presentation slides: [PDF] and poster [PDF], June 2010. This page is maintained by Vlastimil Havran. It was last updated on 30th June 2010.